Famous people born on OCTOBER 30 are likely a workaholic Scorpio. They stay so focused on their goals and maintaining a comfortable lifestyle that they forget what’s important in life sometimes. Their family depends on them to be there for them. They should think more physically than materially when it comes to their loved ones. They may have a few interesting escapades under their belt as they are naturally a peculiar person. What’s different to most people is exciting and refreshing to them. 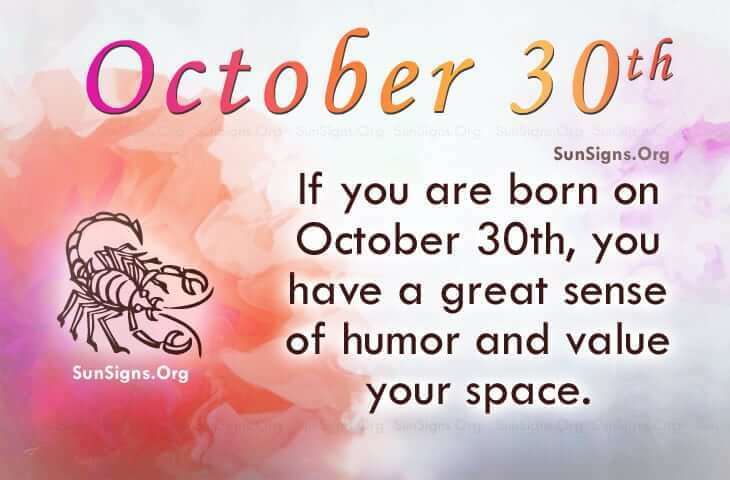 Generally famous people born on October 30 are attractive individuals who have a great sense of humor. They value their space and avoid situations where this could be restricted. But they would typically enjoy the institution of marriage provided they could still enjoy their freedom. As far as their health is concerned, we could say that they maintain a wholesome diet and exercise routine that is conducive to their way of living. They like having their own garden and being able to make their own health juices. Famous people born on OCTOBER 30th may work too much. They should be involved with more than just their job, there is more to life. However, they should not feel guilty about not working hard enough and enjoying life. You only live once.